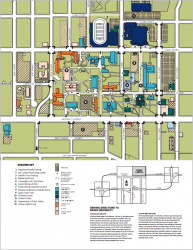 This special DNC Debate campus map shows where to find various Debate Day events, parking, the filing center, space for stand ups, and the spin room. Physical addresses of each building on campus are here. University Avenue between 25th and 28th Streets, including the north sidewalk, which will be closed to pedestrians. 25th Street between University Avenue and Carpenter Avenue, including the west sidewalk, which will be closed to pedestrians. The debate will air on CBS starting at 8 p.m. CST and will be live streamed here. The official hashtag for the debate is #DemDebate. Are you following us? Follow @DrakeUniversity on Twitter. We will be tweeting all week leading up to the debate, during various events the day of the debate, and during the debate itself. Want more? Take a look at our official Drake University social media directory. Looking for directions, a faculty expert, politically active students, or more information? The Iowa Caucus Project, www.iowacaucusproject.org, features a searchable calendar of upcoming campaign events, political analysis by faculty experts, and blog entries by Drake students. We look forward to welcoming you back to campus for one of our many upcoming political events, which will culminate with Drake serving as a caucus site for at least four Republican and two Democratic precincts on February 1.